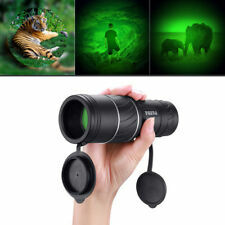 This Hunting Monoculars with 40X60 magnification. This product have focus capability. Single hand operation. Powerful, ultra-compact and ultra-lightweight. It will help you see things in low light, it doesn't help you see things in the dark. Night Prism Feature Absorbs Light For Easier Viewing at Night. 1 x User Manual. 1 x Storage Bag. Multi-Coated Lens For Glare and UV Protection. Item color: Black. Eherebuy is your electronic consultant. 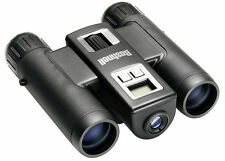 Night vision binocular: Internal rangefinder and compass can be lighted when you are in low light condition. Large 50mm BAK4 objective lens, even in low light conditions(not totally dark), such as at dusk and dawn, it can also provide the maximum brightness of the image. ● Monocular Size: 160 x 50 mm. 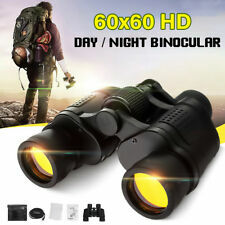 ● Monoculars with 40X60 magnification. 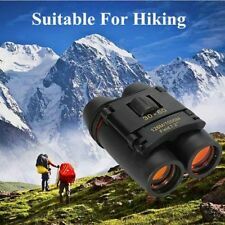 ● Suitable for travel, vacation, walking, hiking, sports enjoy beautiful nature, view birds, watch sorts, general purpose. ● Works well in low light and night. Shuttle mirror: K9. Sheath: rubber skin. Night vision:support. Perfect tool for Sightseeing, Watching Match, Concert and Hunting. Relative brightness: 25.00. Angle: 8.2 degree. 1 x User Manual. Field of View: 8mftat/160000m. 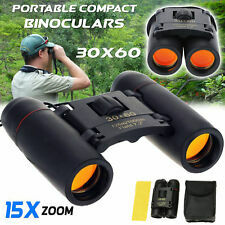 Enjoy superior image clarity while you use this pair of 30 x 60 binoculars. It uses prism design which ensures clear and brighter viewing. Ideal for bird watching, sightseeing and other sporting activities, the binoculars features a red coating film for improved Transmittance and Image Brightness under low light conditions. Leupold BX-1 Rogue 10x25mm Compact Hunting Binocular, Black - 59225. 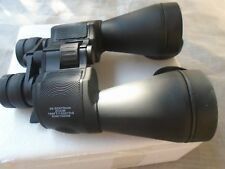 Up for sale a these fabulous Leupold Binoculars 10x25 used but in excellent condition. Reverse Porro prism light path produces a compact housing with a rich depth of field. These binoculars are in used shape. This will be a great addition for any binoculars fan or collector. I have taken pictures from different angles so that nothing is hidden and you can see exactly what you will be receiving. Orion Model 9326 25x100 Astronomy Binoculars and Manufactures Carrying Case. Condition is "Barely" Used. All Nikon products include Nikon USA's full or limited warranty. Nikon Prostaff 7s Binocular 42mm Roof Prism Armored. For four generations, we've relied on family-centric values and the examples of character Vernon Kinsey, our founder, gave us. Model: 59225. 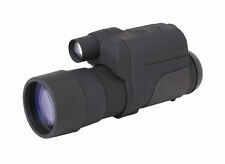 Leupold 10x25 BX-1 Rogue Compact Binocular, Porro Prism. · The Inverted porro prism design makes them incredibly small and lightweight, without sacrificing any optical performance. · Reverse Porro prism light path produces a compact housing with a rich depth of field. Trending at $24.69eBay determines this price through a machine learned model of the product's sale prices within the last 90 days. Vortex Diamondback 10x42 Binoculars. Condition is Used. In great condition. Comes with everything pictured. Shipped with USPS Priority Mail. ● Powerful, ultra-compact and ultra-lightweight. ● Works well in low light and night. ● Suitable for travel, vacation, walking, hiking, sports enjoy beautiful nature, view birds, watch sorts, general purpose. Powerful, ultra-compact and ultra-lightweight. Suitable for travel, vacation, walking, hiking, sports enjoy beautiful nature, view birds, watch sorts, general purpose. Single hand operation. Works well in low light. Leupold BX-1 Rogue 10x25mm Compact Hunting Binocular, Black - 59225. Reverse Porro prism light path produces a compact housing with a rich depth of field. Dioptric Correction Not Specified by Manufacturer. 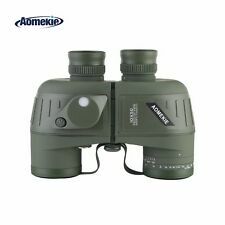 This 10X50 binoculars with large full-multi-coated lens and rangfinder compass. Its good for watching sky, views and so on. Large 50mm objective lens, even in low light conditions, such as at dusk and dawn, it can also provide the maximum brightness of the image. Magnification: 13x50. 1 x Monocular. Built-in Distance Reticle. Built-in ranging reticle, ranging slide rule function. Low-light night vision features a wide field of view by faint light, starlight or moonlight. Prism Type: BaK4. Monocular Size: 160 x 50 mm. Single hand operation. Field of View: 500M/ 9500M. Field of view: 6.4°. Color: Black. The larger the objective lens, the more light that enters the binocular, and the brighter the image. 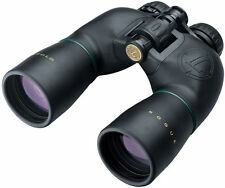 We have 80 pairs of night vision 16x60 power binoculars. Vortex Recon 15x50 R/T Ranging Reticle RT155— I bought this scope and took it out of the box—looked it over and put it back in the box—it has not been in the field!!! You get everything pictured in the photos!!! In great condition!!! VORTEX LIFETIME WARRANTY!!! Free Priority Mail shipping!!! Thanks for looking!!! Email with questions??? My father picked it up on a trip to Afghanistan in the 90's. When I got them I put batteries in and used it in the house, took 3 or 4 photos and 1 video. Then removed batteries and SD card and put it in the safe and that is where it has been ever since. I also printed out the manual off the web site and am including that. Add to that the convenience of AA batteries and an extra-rugged, water-resistant housing, and the result is a digital night vision monocular that performs well no matter the situation. For others, there is the Equinox Z.
Vortex Recon 15x50 R/T Ranging Reticle RT155. Condition is brand New in box.Shipped with USPS Priority Mail. Application: Boating / Yaching, sports, bird watching, auto racing, horse racing, hunting, beach, travel. Lens:Multi-Coated Lens For Glare and UV Protection. 1 x User Manual. Field of View: 108m/1000m. Application: Boating / Yaching, sports, bird watching, auto racing, horse racing, hunting, beach, travel. Do not attempt to clean the Binocular inside or try to remove the Binocular. 1 x Storage Bag For Binocular. night hero binocular night vision. Condition is New. Shipped with USPS Priority Mail. 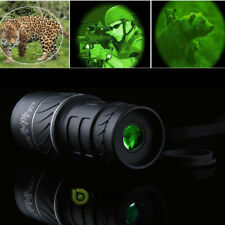 Easy focusing Suitable for Golf, Scope, Camping, Hiking, Fishing, Bird watching, Concerts, etc. Note: this 40x60 Monocular Built in a tripod screw hole. What you got: 1x 40x60 Monocular, 1 x Bag. See things 40X closer and Get Clearer and Brighter with 60MM Objective lens and 16mm eye lens.The larger the objective lens, the more light that enters the monocular, and the brighter the image. HD vision monocular: 40X magnification with BAK4 prism lens design, giving you a clearer and more colorful scenery. Prism Type: BAK4. - With the compass: a compass on the monocular, never need to worry that you could be lost on the trip. Manufacturer's Part Number 16003. Weight: 22.8 oz. Exit Pupil: 4.2 mm. Angular Field of View 6.2Â°. Close Focus Range: 13.1'. Field of View: 325.3' @ 1000 yards. UPC 018208160037. Bright, Full Multicoated Optics for anti-reflection and excellent brightness and resolution. 10x42 Binoculars HD Professional Binoculars with BAK-4 Prism FMC Lens for Sports. And smartphone adapter allows you to capture and record beauty all around you! Model: 10x42 Black; Magnification: 10X. Usage: dust-proof, windproof, anti-stamping, night lighting. Night vision goggles with flip-out lights. 1 x Night Vision Goggles. Green tinted lens with etched graphics that glow when lights are on. Ergonomic design, wide vision and safety to wear. Take these quality and cost effective binoculars on your next outdoor adventure. Manufacturer's Part Number 8244. Exit Pupil: 5.0 mm. Angular Field of View 9.3Â°. Close Focus Range: 16.4'. Field of View: 488.0' @ 1000 yards.